One of our core beliefs at Rose Community Foundation is that by combining leadership with grant dollars, we can make a greater difference. A long-standing collaborative project, Senior Source, is bringing together leadership and funding from foundations, government, business and nonprofits to make life better for older adults and their caregivers in Greater Denver. The name, Senior Source, is likely familiar. 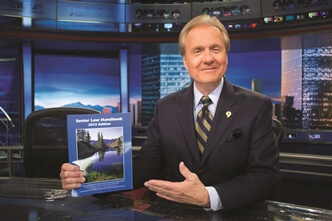 For the past nine years, 9NEWS reporter Mark Koebrich has been the face of this successful educational campaign that helps older adults and their caregivers access information and resources on aging and caregiving. Studies both in our community and nationally continue to show that knowing where and how to find such information presents an ongoing challenge. Senior Source uses a combination of methods to get information into the community. Each month a different topic is featured extensively on 9NEWS, and viewers can talk to experts by calling a local or toll-free number located at the Colorado Department of Human Services – Aging and Adult Services. They can also request free copies of guides and handbooks produced by community experts, and find a wealth of information on a comprehensive website, SeniorSourceColorado.com. The information is carefully screened to ensure Senior Source remains a trusted resource. The project is a collaboration of several organizations, all of which provide expertise on aging topics and funding support. The partners include Caring for Colorado Foundation, the Colorado Department of Human Services – Colorado Commission on Aging, the Colorado Health Foundation, Denver Regional Council of Governments – Area Agency on Aging, 9NEWS and Rose Community Foundation. The Colorado Department of Human Services manages the program and is the grantee. Senior Source is a highly valued resource that continues to serve more people every year. Annually, the website sees 70,000 visits and an estimated 5,000 calls and emails are received. Last year, more than 11,000 copies of free materials, including the Getting There Guide to transportation and the Senior Law Handbook, were distributed. Rose Community Foundation has been a Senior Source partner since its launch in 2005. Since then, we have helped guide and develop the program, and provided more than $2 million in funding support.